Our games make a great gift! Click the gift box for instructions. Our games play "smart and fast". We endeavor to make the games visually appealing, but skip the glitzy effects that can distract from the fun of a mind-puzzling game of your favorite solitaire. In short, we want our game interfaces to be simple to use, yet feature-rich. We generally encourage healthy social interaction for our patrons, but for those times when you are alone we provide some interesting diversions. 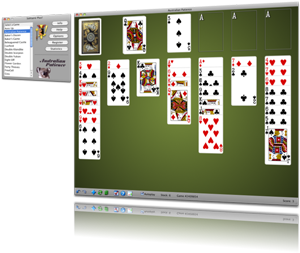 30 great solitaire variations including the Klondike, FreeCell, and Spider favorites. Automatic game saving/restore including complete undo/redo history. Large and realistic cards that fill the largest iMac's screen. Great game play with our unique smart-dragging™ feature and optional One-Click moves. Runs on MacOS X version 10.7 or later, including Mojave. Universal legacy versions for OS X 10.1 to 10.6 are also available! Does not require "hardware acceleration" to play fast. Large and realistic cards that fill the largest flat screens. Smaller card size options that work on laptops, Pro tablets and netbooks for all games. Great game play with our unique smart-dragging™ feature. Runs on Windows 98/ME/XP/Vista/Win7/Win8/Win10 including Starter, 32- and 64-bit editions. 1 Offer does not include access to the iPad version as Apple requires all iPad apps be distributed through the Apple App Store. MacOS is a registered trademark of Apple Computer, Inc., registered in the U.S. and other countries.